The problem with knitting a pair of socks is that you have to make two of them. I’ve finished one. It’s sufficiently sock-like even though I feel I made a poor choice on the toe bind-off (three needle, for all of you keeping score). Note the spiffy new Blue Moon sock blockers. I want to knit sock #2 exactly 3%. But I will anyways, because I try very hard to be a well-behaved knitter. Quick! Cast on, before you lose your momentum! That second sock syndrome is tough. Your first one looks great. 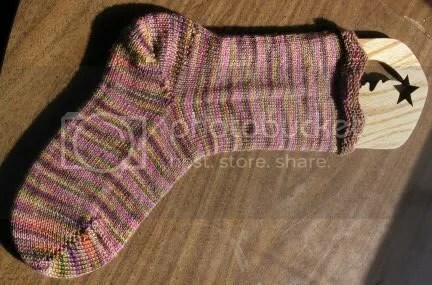 Have you seen Knitting Daily’s tip on kitchenering sock toes? Very helpful. And my other fave way to finish a sock: run the yarn through the leftover stitches (about 8) and pull. Sew in ends. Bad, bad, me! That’s why I knit two at once (I use DPNS, I just divide the ball and start two sets). Because it makes me finish the second one, which hopefully isn’t far from done.